Ben Write and Sally Read explain the summer reading program. The program runs during the months of June and July at the Garmisch library. GARMISCH, Germany — During the months of June and July, the library will host a variety of free activities for children of all ages to encourage and support a love of reading. 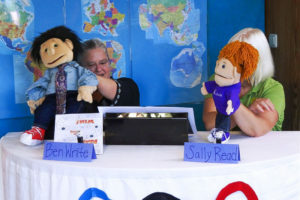 About 20 children and a few moms joined Ben Write and Sally Read for the first get-together at the Garmisch Library, on June 22, to kick off Summer Reading Fun. The smart puppets — presented by Shellie Hanson, library employee, and Laurel Kelly, volunteer — welcomed the audience spread out comfortably on carpets in front of their press conference table. Ben and Sally introduced the summer reading program and explained how children have to log in reading hours in order to win great prizes. With the log, kids track their hours and mark off squares as they go. Every time they mark six squares, they earn a raffle ticket for a chance to win prizes like ice cream coupons, toys and tickets to the Summer Rodelbahn by the Olympic Ski Stadium. Participants can either read books themselves or have someone read to them. Even time they read to someone else, it counts. This year’s theme, “Read for the Win,” coincides with the 2016 Summer Olympics, the world’s biggest sporting event. Ben and Sally explained the history of the games, procedures like the opening ceremony, numbers of participants and involved countries. The reporters interviewed the audience to name a few of the participating countries. Italy, France, Germany, Australia and finally United States of America were the answers from the floor. Just as they talk about the 12,000 torch bearers that will carry the Olympic torch to the stadium in Brazil, the local torch bearer, golfer Michael Haney and deputy garrison manager, marched down the red carpet with the torch and greeted the crowd on the carpet. For three more weeks, everyone will get together on Wednesdays at 10:30 a.m. to share stories and crafts and learn more from Ben and Sally. It’s not too late to join the group, so be sure to stop by the library and sign up for the program.